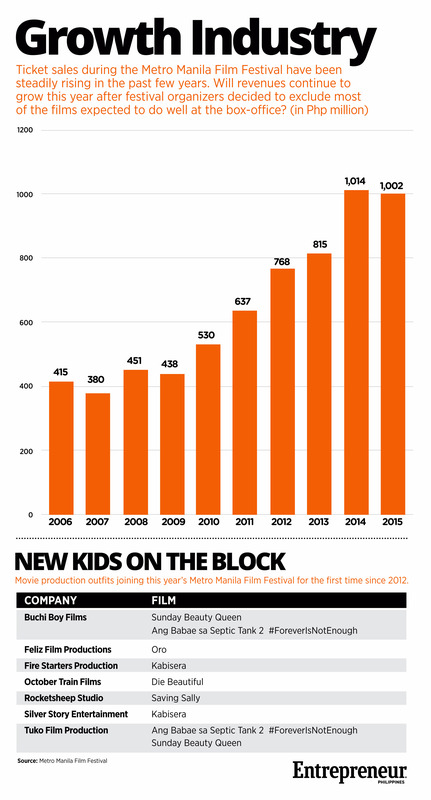 (Infographic) Can MMFF Films This Year Earn As Much As in Previous Years? Radical change has come even to the annual Metro Manila Film Festival (MMFF), which starts tomorrow, December 25. 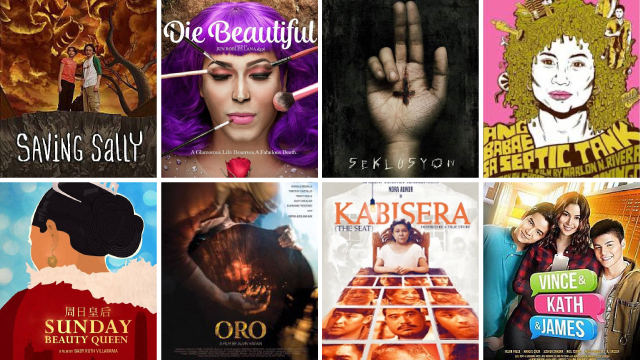 Entries from previous years comprised of familiar MMFF stars like Vic Sotto and Vice Ganda didn’t make the cut, while some indie films, including a documentary, got the nod. Under the new rules, finalists were assessed based on story, audience appeal, overall impact, cinematic attributes and technical excellence, global appeal and Filipino sensibility. Some fear the fest would not earn as much as it had in the past years without any blockbuster stars headlining any of the movies. In 2015, the MMFF grossed more than a billion pesos. Despite such concerns, some of the country’s leading production houses and yearly contenders in the festival are still part of the annual affair, only this time, their main entries headline relatively new under-the-radar actors and produced with smaller budgets. ABS-CBN’s Star Cinema for example, the same producer of Vice Ganda’s top-grossing films in the past years, has the romantic comedy Vince and Kath and James as its main entry this year. Quantum Films, who won the past two years’ Best Picture recognition, has Eugene Domingo’s comeback film Ang Babae sa Septic Tank 2 #ForeverIsNotEnough as its entry, which it co-produced with Tuko Film Productions, Buchi Boy Films and MJM Production Inc.
Regal Films, headed by industry stalwart Mother Lily Monteverde, has the internationally-acclaimed Die Beautiful as its main offering this Christmas, co-produced with October Train Films. Award-winning director Erik Matti’s Reality Entertainment, meanwhile, produced this year’s lone thriller in the roster, Seklusyon. The new rules ultimately gave way to independent production houses with half of the roster produced by studios joining the fest for the first time. Two-year-old Fire Starters Production and Silver Story Production made it with their first film, Kabisera, starring Nora Aunor. Also a newbie in the MMFF is Feliz Film Productions which produced the drama Oro. Animation house Rocketsheep Studio finally finished its partly animated film Saving Sally after 10 years in the studio, while the first documentary to ever become part of the MMFF lineup, Sunday Beauty Queen, is produced by Voyage Studios.